Woodbine Legacy Investments (WLI) launched a $20 million renovation on W Atlanta-Buckhead, a 12-story, 291-room full-service luxury hotel in Atlanta’s affluent Buckhead neighborhood. The renovation began in May 2018 and will be complete in late December 2018, just weeks before the city hosts Super Bowl LIII. 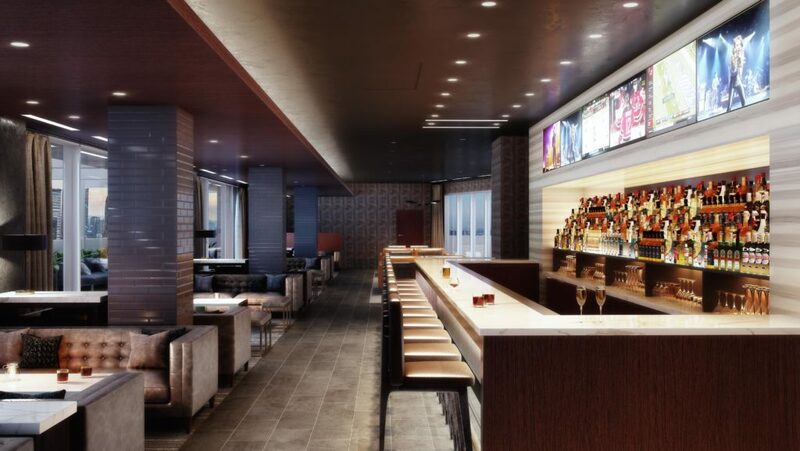 Woodbine hired C+TC Studio of Atlanta as the architect and interior designer for guest rooms and the hotel’s rooftop bar, Whiskey Blue; STUDIO 11 of Dallas as the interior designer for the lobby, public areas and meeting space; and Genoa Construction as the general contractor for the project. Taking cues from Atlanta’s Southern location, and bent toward fashion, design and art, the top-to-bottom revamp includes a lobby redesign (pictured above) that delivers on form and function, with the addition of a dedicated welcome area for the Whatever/Whenever concierge team; new furnishings; and a café-style seating arrangement that lends well to work or R & R for individuals and groups alike. The new, flexible layout will also flow easily from day to night, providing a calm, comfortable and swanky space by day and a dynamic, energetic setting with a DJ booth by night—always showcasing fashion, art, music experiences and more. Also, in the lobby, there will be a new custom mural by the W photo booth, allowing guests to take photos that will then be displayed on loop with a Polaroid-style treatment on a nearby screen. The hotel’s 11,000 square feet of flexible indoor/outdoor meeting and event space will receive new furnishings, paint, carpeting, lighting and artwork, along with enhanced spaces for breakout sessions and pre- and post-function events and activities. The fitness center, where guests can enjoy views of the city, will also get a new artful look. Additionally, Woodbine is upgrading all internet cables for faster connectivity throughout the hotel. 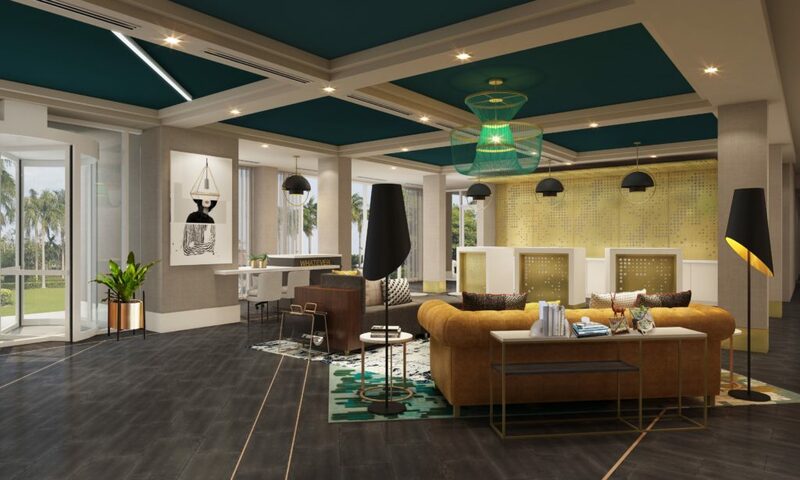 Guest accommodations—which include 286 guest rooms plus 4 WOW Suites and one EWOW Suite—will get new headboards, armoires, sophisticated damask wallcoverings and carpeting, 55-inch televisions, in-room Nespresso machines and beverage bar, and vivid artwork throughout. All guest rooms have splashes of color and an unexpected blend of graphic and sophisticated elements to create a space that’s compelling, energizing, inspiring and comfortable all at once. Air-conditioning window units will also be removed from all guest rooms, decreasing system-related sounds—and more important, making room for a window portal to frame up a new work/lounge area featuring chaise, a cozy table and cocktail cubby. Guest bath updates include bold wallcoverings and new, glamourous sliding glass doors for augmented privacy. Guestroom corridors also have new wallcoverings, carpeting and lighting throughout. W Atlanta-Buckhead’s award-winning rooftop bar, Whiskey Blue (pictured below), operated by Gerber Group, is also being transformed. The update is evolving and upgrading this longtime hotspot, which opened to much fanfare 10 years ago and quickly became one of city’s most popular places to see and be seen. Updates to Whiskey Blue will include new furnishings, flooring, wallcoverings, lighting, artwork, terrace furnishings and landscaping, as well as changes to the entrance elevator and surrounding rooftop. These updates are anticipated to be finished in late October. W Atlanta-Buckhead is tucked into the well-known and beloved Buckhead neighborhood, which boasts a 13-million-square-foot mixed-use district with a lineup of best-in-class retail, high-end residential, office, entertainment and lifestyle amenities and more. To learn more, visit www.marriott.com/hotels/travel/atlbw-w-atlanta-buckhead/.